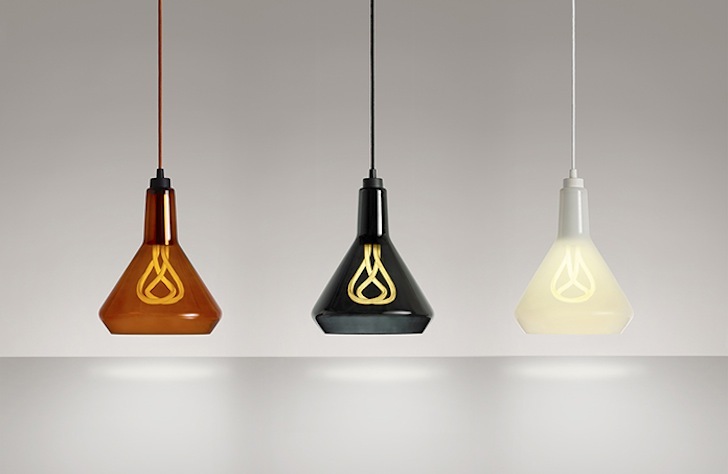 Design brand Hulger just introduced the latest addition to their award-winning, energy-efficient lighting family: the Plumen Drop Top Lamp Shade (A). Made from mouth-blown glass, the Drop Top is Hulger’s first lampshade designed with the Plumen 001 in mind. The tinted and transparent shade flares out in an A-line shape to flatter the pear-shaped Plumen 001 bulb and direct light downwards. The shades can be purchased separately in one of three colors–amber, black, or white. Design brand Hulger just introduced the latest addition to their award-winning, energy-efficient lighting family: the Plumen Drop Top Lamp Shade (A). Made from mouth-blown glass, the Drop Top is Hulger's first lampshade designed with the Plumen 001 in mind. The tinted and transparent shade flares out in an A-line shape to flatter the pear-shaped Plumen 001 bulb and direct light downwards. The shades can be purchased separately in one of three colors--amber, black, or white.